It’s funny how we haven’t even played one single iota of regular season baseball yet, but some folks are already counting out the 2009 Toronto Blue Jays. Places like Walkoff Walk, Big League Stew and even Jordan Bastian even have the Jays projected as low as 5th place in the American League East. Is that maybe a harsh assessment of a team that has been one of the best in baseball over the past 3 seasons? Yes, it was a little disappointing that J.P. Ricciardi didn’t land any big name free agents in the off season. But opening up the chequebook and bringing in new players doesn’t always necessarily translate to success. At the beginning of 2008, a lot of people pegged the Detroit Tigers as favourites to make it to the World Series. So for the Yankees to sign Mark Teixeira and C.C. Sabathia, it does make them a better team on paper, but that doesn’t mean that makes them the automatic favourite to run away with the division. Let’s also keep in mind that a lot can happen over the course of 162 games. No team in baseball is immune to injuries, losing streaks, or just plain lack of production. For example, your fantasy baseball team might be a pre-season favourite to win on paper, but in order win, a lot of things need to go right to become successful. Proven players who are expected to deliver (Hallday, Rios) need to live up to their expectations. Then there needs to be young players that set the bar high (Snider, Romero, Purcey). Finally, to have a successful year, the entire team needs to step up and fill the holes if anyone goes down to injury. It’s part of my duty as a Jays fan to be an eternal optimist. I’m not expecting the Blue Jays to be the 2008 Tampa Bay Rays, but I am certain that the Blue Jays will not finish the season at the bottom of the division. Remember, keep the faith and “believe the madness”. 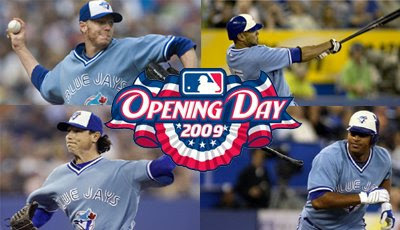 Opening Day 2009: The Day has come! Now that’s my kind of optimism. Hell yeah, you gotta believe Carson!